Yves here. Gail Tverberg hasn’t been posting her carefully argued pieces on energy, particularly “peak oil,” and environmental issues as often as she once did, so I was glad to see this piece. Even with these adjustments, it seems to me that the situation is likely to be even worse than most Peak Oil analyses suggest because of the interconnected nature of the economy and the fact that world population continues to grow. The economy cannot get along with a sharp reduction in energy consumption per capita. Some governments may collapse; many debtors may default; some banks may be forced close. The situation may resemble the “societal collapse” situation experienced by many early economies. The story told by Peak Oilers is based on the assumption that oil is our big problem and that we have plenty of other fuels. Oil is indeed our highest costs fuel and is very energy dense. Nevertheless, I think this is an incorrect assessment of our situation; the real issue is keeping the average cost of energy consumption low enough so that goods and services made from energy products will be affordable by consumers. Even factory workers need to be able to buy goods made by the economy. A collapse based on prices that are too low for producers will not occur immediately, however. The problem can be hidden for a while by a variety of techniques, including additional debt for producers and lower interest rates for consumers. We seem in the period during which the problems of producers can be temporarily hidden. Once this grace period has passed, the economy is in danger of collapsing, with oil not necessarily singled out first. Perhaps there is a need for a substitute for Net Energy, calculated compared to the budged maximum expenditure for the function of “Energy gathering, processing and distribution.” For example, the term Surplus Energy might be used instead, calculated as (10% x Energy Output) minus (Energy Input), where Energy Inputs are subject to suitably wide boundaries. If an energy product has a very favorable evaluation on this basis, it will be inexpensive to produce, making it affordable to buyers. At the same time, the cost of production will be low, leaving plenty of funds with which to pay taxes. It strikes me that this argument has profound implications for any kind of “carbon pricing” scheme aimed at addressing climate change by radically increasing the relative cost of fossil fuels. Sadly neglected in this argument are the economic incentives imposed by the sunk-cost infrastructure of fossil fuel processing, distribution and use. Extraction is one end of a long straw and there is a strong suction set up from the other end, that works against short supply and high price. The pressure to continue to extract the volumes needed to fill the “pipeline” (metaphor for the whole vast system reaching down to consumer lifestyle) seems to likely (as it has) to increase the externalization of extraction costs. We just ignore the financial craziness and poisoning the ground water etc. Peak oil as an idea has been influenced too much by high price as the path to apocalypse, when the economic danger is prolonged low price but continued volume. Gail has been emphasizing these points for some time now, so no surprises here. “Peak Oilers” have likewise moved on for the most part from the idea of impending doom due to absolute shortages, to the more nuanced concepts discussed above. For myself, I’d take all of the above a step further, which commenters to this post in Gail’s blog did as well, and note the synergistic effects of peak oil, peak finance, peak population, and peak environmental destruction (including AGW) all indicate a perfect storm of sorts rapidly coming our way, the exact timing of which still can’t be predicted, but the magnitude and effects of which we have continually underestimated since Limits to Growth and William Catton’s Overshoot fired the first warning shots. Ominous indeed. add peak fresh water, peak potash, topsoil, biodiversity, and on and on. oil is just the doorway to a greater understanding if limits. we’ll either expand off planet, figure out how to limit ourselves somehow, or Gaia will figure it out for us. Look at original posting site for today’s post at OurFiniteWorld [https://ourfiniteworld.com/]. The brief for today’s post immediately preceeds the brief for “2019: World Economy Is Reaching Growth Limits; Expect Low Oil Prices, Financial Turbulence”. 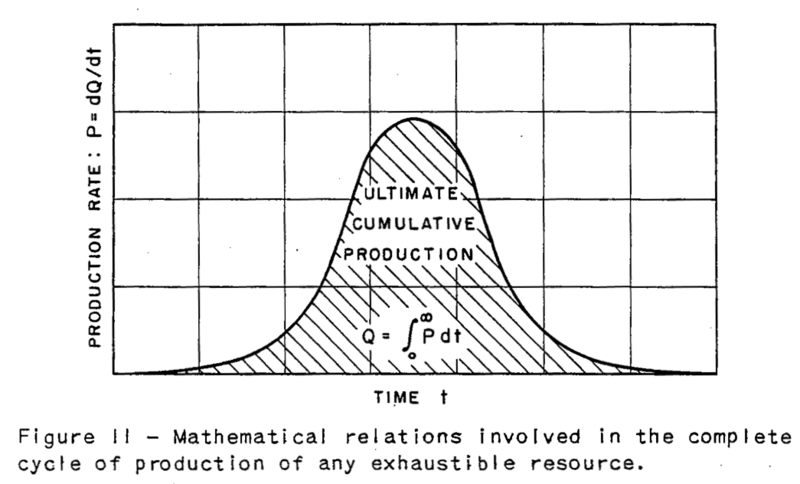 The “figure 1” which appears in that brief shows a colorful diagram taken from the book “Revisiting Limits to Growth after Peak Oil”. The time between 2019 and 2050 looks especially interesting with exciting times all the way to the end of the diagram at 2100.
: Limits to Growth mainly showed population collapse due to pollution. As the time ‘pollution’ mainly meant toxicants like mercury and benzene. Climate change wasn’t really on the radar, but a couple of the model runs map well to what is happening. : The financial part is critical. Don Lancaster gets into this in his ‘Energy Fundamentals’ at Tinaja.com, pretty much shreds the ROI beyond the EROEI. : “For example, the term Surplus Energy might be used instead, calculated as (10% x Energy Output) minus (Energy Input)” Yeah no, that’s a Shadowstats-style oversimplification. The takeaway should be that the numbers are an entirely inadequate representation of the path-dependence of the energy usage. That’s two kinds of numbers: the energy usage is physically too complex to model well, and the price at point-of-sale is dependent on the needs of the seller and not the energy cost. Hmmm…. Interesting but… During the ”peak oil” concerns of the early 2000s I was working in a job that required I understand the dynamics of oil supply and demand and pricing. I soon realised it was the cost of extraction that mattered most rather than a lack of oil itself. This is a large part of Ms. Tverberg’s argument, so I agree. However it seems to me she makes the same error that The Limits to Growth was criticised for: the assumption of constant technology – a significant error in evaluating a capitalist economy. On that score I remember reading glowing predictions in the early 2000s about horizontal drilling for oil, a method to re-drill old oil wells and extract a lot more oil from them, and believing they were overblown. I was wrong. Massive new quantities of oil were extracted. It was also said the production of oil from the tar sands would remain very expensive but then extraction costs dropped a lot. So I am now a believer that capitalist enterprises with lots of money will develop new technologies that reduce costs considerably. Of course we will ultimately run out of oil because it exists in finite quantities. However my current view is that well before we run out of oil that can be profitably extracted the earth will have become unlivable for large mammals, including humans, due to climate change. Unless we do something meaningful to prevent it. Rereading Ms Tverberg’s piece I note she does make a passing reference to tech change but in my opinion does not do it justice. In addition if the price of oil does rise there will be substitution away to other energy sources, conservation, etc., since there is huge waste today and alternative sources are underused. In the past there have been huge swings in the price of oil and while it has caused problems there was no ”economic collapse”. In summary while Ms. Tverberg does point out a number of interconnected issues I think her fears of ”economic collapse” are overblown. It seems to me the costs can’t be measured purely in dollar terms, due to the gaping externalities hole in our capitalist system. As we move from easy oil to oil that is less pure, deeper, and/or under less pressure, we resort to solutions that impose greater external costs in terms of environmental damage (fracking, mountaintop clearing) or risk (deep water drilling, e.g. the BP disaster). So even if we come up with new ways to continue extracting oil at price points ‘the economy’ finds acceptable, we are still heading towards a point of unacceptable cost — or we are blowing past that point because ‘the economy’ is blind to the categories of cost that can be excluded from capitalist ledgers. I shouldn’t have mixed in the coal extraction technology when I opened the sentence with oil as the subject. The model of increasing cost, damage, and risk does apply to all hydrocarbon extraction, though. Yes, and bankruptcy of oil companies, if occurring when oil is still predominant, will be met with bailouts. Big Oil is no less important and influential than Big Finance. The Limits to Growth team ran a number of simulations with different assumptions. Several of those scenarios assumed a doubling or quadrupling of technological efficiency. Their conclusion was that even if technology improved to the point where we could do four times as much work or create one-quarter of the pollution at the same energy consumption, this would still not prevent a population peak during the 21st century. The ‘business as usual’ scenario was the one that assumed steady levels of technology. I first encountered Peak Oil discussion back in 2007-2008. I recall a lot of graphs that peaked around 2012 or 2016 with precipitous cliffs thereafter. I also recall that a lot of the same people interested in those topics engaged in gold-bugging and doom-mongering around fiat currency, debt levels, and the mortgage crisis. Fortunately while our economy is energy based it’s also fiat based with a currency that can be created and destroyed at will. Policy makers had plenty of headroom to forgive the debts racked up by Wall Street. > A collapse based on prices that are too low for producers will not occur immediately, however. The problem can be hidden for a while by a variety of techniques, including additional debt for producers and lower interest rates for consumers. We seem in the period during which the problems of producers can be temporarily hidden. Once this grace period has passed, the economy is in danger of collapsing, with oil not necessarily singled out first. To me this paragraph reveals the same confusion I encountered in 2008. The real issue is not debt levels of producers or consumers, it is EROI. In the US we have shale producers who are buried in debt up to their necks but kept alive by what appears to be an implicit policy decision to allow them to rack up more debt. As MMT tells us, as long as real resources continue to be made available to energy producers, their debt levels are irrelevant. They can continue to produce energy. It is possible that EROI may be marginal for some energy producers. It may even be negative in some cases. This means that real resources will be cannibalized from elsewhere in the economy to allow energy producers to continue. It occurs to me that one way to achieve this would be to immiserate the working class by denying them access to real resources such as transportation. It is possible that policymakers are aware of the trade off, but it strikes me as more likely they are not. They simply mash buttons on the economy (interest rates and so forth) but the real gas pedal and brake pedal lie elsewhere. Therefore the economy picks up when energy producers resort to a new form of energy extraction (fracking) and it dials down when those producers are unable to continue. When another chunk of the population is driven into poverty and lacks the ability to consume energy, energy prices decrease and the economy picks up again for everyone else. For a while. So it remains to be seen how long the North American frackers are able to continue and how quickly additional fracking sources can be brought online in other continents. 1) It strikes me that a Green New Deal provides the opportunity for a public conversation to take place regarding how energy and resources should be allocated within the economy going forward. If resources are reallocated to efficiency or energy production, who knows, we could continue to keep the plates spinning a while longer. 2) In Minnesota this week there were natural gas shortages and outages. The outages were local but the shortage was statewide — all MN household customers were asked to reduce thermostats to 63F and decrease use of natural gas water heaters, etc. This was during -30F weather. Decaying infrastructure + peak energy + climate volatility make a deadly combination. I’m still working down my supplies of Y2K toilet paper. of various disasters we would now be homeless. If we are dealing with a fish or some other animal, the amount of energy that the animal can expend on gathering food is not very high because it needs to use the vast majority of its energy for other purposes, such as respiration, reproduction, and digestion. In general, a fish can only use about 10% of its energy from food for gathering food. In human terms this other purposes include using my yatch to have a trip with my friends, by car to the pub for beers,fly to Thailand next summer holidays… and with this range of energy consuming activities we may be using about 0,1% of our energy output to gather energy with waste ranging 99% of our activities. This may seem exaggerated but I think there are cases that exceed that 99%. 1. Tverbers’ focus on costs appears to pretty much neglect the ‘externalities’ connected with the continued consumption of fossil fuels. For example, how much is it going to cost if the world’s major metropolitan centers have to be moved 10 miles inland in this century? For that matter, is cost even relevant if the continued use of fossil fuels renders the planet uninhabitable for our species? 2. There are issues connected with ‘affordability’ that go well beyond whether or not energy providers will be able to make enough money to pay their costs. Even when ‘cheap oil’ was abundant workers forced to compete with fossil fuel powered machines could not ‘afford’ all the wealth industrial capitalism was supposedly producing. Off-shoring is just another example of the short term, devil take the hindmost perspective finance capital has taken regarding management of the economy. Oil has been called ‘the devil’s excrement’ with good reason. See Oil, Power, and War: A Dark History by Matthieu Auzanneau. Lots of energy, food and water, but infinite, and still increasing, people. Not to worry. Those ‘increasing people’ will, in one way or another, will become food for Gaia’s other lifeforms, big or small … most likely the latter, sooner, or later. Who knows, portions of Humanity might actually be preserved as a geological layer, to be discovered by some future sentient species .. I think we are going to see the nature of the need for energy begin to drive the production of oil and gas. Oil and gas are very portable and good for mobile applications. Many of the renewable sources, such as solar, wind, and hydro require significant fixed plant investment for both creation and transmission, whereas you can put some oil in a tank and easily move around with it. So I think we will continue to see the shift of oil and gas being extracted for use in the chemical industry and as a fuel source for mobile solutions like vehicles, planes, and ships operating outside of electricity grids. Texas is currently a massive wind power state and electricity generated by wind power can be used to extract oil and gas which then gets used primarily for mobile solutions. So the extraction of oil and gas will likely be driven by the cost of whatever could replace it to move ships, planes, and interstate vehicles around. We are seeing this shift in coal where coal mining for use in the US is increasingly just for metallurgical coal (Appalachia coal) instead of power generation. Power is increasingly being generated using sources other than coal. While oil (gas, diesel, kerosene) are essential fuel for mobile transportation (cars.trucks, planes) it is still creates too much CO2 in the atmosphere. A reorganization/conservation in our methods of mobility (individual cars vs. mass transport) is important also. I may have missed it, but it seems like the focus on affordability misses a more critical energy measure, the energy required to extract a certain amount of energy. The following presentation seems, at first, perplexing, but makes the point that the energy required to extract harder-to-get oil reduces the fundamental energy extracted, to the point that it may take more energy to get the oil that it contains. I am also a bit confused by the claim that wind and solar are subsidized, as if oil and particularly nuclear are somehow not beneficiaries of years of subsidies, most of which are ongoing. Yes, that last part, the subsidies for oil and nuclear, confuses me as well. And someone above made a good argument about sustainability that boils down to, if everyone is (or even enough of us are) dead from climate change due to the continued use of carbon releasing energy sources, our economy still won’t run as efficiently as required, or perhaps at all, accurate ENROI or no. Another part of this whole discussion that is not mentioned or factored in, at least as I understand it and that may not be particularly well, is conservation of energy as a critical part of any mix. Assuming that sustainable energy becomes critical due to the existential threat posed by carbon based fuels, energy conservation becomes the cushion that might provide more elasticity for a smoother transition. It’s likely that we simply have to accept that our current global economy simply has to change radically to adapt to sustainable energy levels (and by sustainable I include avoiding the toxic effects of climate change). If that means we can not maintain the technology needed to produce cheap enough and profitable enough energy that is sustainable and non lethal to humans and our ecosystem (web of life), then indeed we have a problem. I agree. I first heard about Peak Oil thru the Dieoff.org people, and they expressed in terms of energy cost of extracting energy. For them the there’s a hard stop where there’s lots of oil still in the ground but the amount of energy needed to extract it makes it not worth the effort. They use a similar basis for assessing other proposed solutions. E.G. what is the cost of isolating hydrogen vs the energy storage benefit? It strikes me that Ms. Tverberg’s contention that any replacement from fossil fuels has three conflicting demands is false in an ecologically-focused MMT-world. While demands (a) and (b) make sense for any input to the economy, there is no reason we need to significantly tax the difference between the price of the non-fossil fuel energy and its cost. * it has serious negative externalities (environmental, human health or even geopolitical) that need to be properly accounted for in its price (and that clearly still are not). Solar and wind are plentiful and have lower negative externalities so the taxes we place on them don’t need to be anywhere as high. Additionally, if we managed government budgets according to MMT principles, as long as we are taxing enough to keep the economy from overheating we are good, wherever our tax revenues come from. So raise taxes on fossil-fuels because that is the right way to account for its true cost, but don’t damn renewables because we cannot tax them high enough. I certainly agree with this thread. This is one of the most important postings I have read anywhere. I remember way back when Yves talked about how fracking was a fantasy because it cost more to extract the fuel than could be recovered. This post is as if Tverberg just analyzed the entirety of capitalism. Because capitalism, in order to make a return, always externalizes costs. You can subsidize profit only so long by socializing losses – then it’s game over. And those losses, like energy losses, are not even accounted for accurately because, statistically, we don’t even measure them. (Except to superficially acknowledge things like poverty and pollution). We can take a more critical look at the economy and profitability, etc. but there is so much that still goes unaccounted for. Pollution and waste of all kinds. Her analogy with a fish is so very profound. It’s the takeaway I will tell everyone about. And in that context I think she is pointing the way to some serious new accountability that includes all the losses. Or wasted surpluses. If we set our best engineers on it now we could probably create systems, devices, etc that captured that wasted energy much more efficiently. Living in apartment buildings rather than single family homes. Even designing electric appliances that store and share energy, slowing the dissipation of energy through a house or factory. Etc. Like life itself evolving to take advantage of entropy – the dissipation of energy on the planet creating new life forms. And etc. What chaps me most is that the people who profit from externalizing all those costs (that equal a whole lot of horror, misery and death) never have to experience any of the consequences. Either they live in their perfect wealth bubbles in the “now” and will get to live out their special Tony Hayward lives (the former BP CEO who brought us the Deepwater Horizon Gulf of Mexico blowout and sequelae) and get to die in maximum pleasure and comfort, perfectly cared for by humans who have the caring gene on both chromosomes, or they are already dead — and in either situation, are beyond any retribution or restitution. Buffett and Dimon and Blankfein and Zucker and Gates and the creatures in the black hole called “Monsanto” and the various politicians and high military officers and the rest, enjoy the impunity of immunity. And remember the bit about nuclear power rendering electric energy “too cheap to meter?” You mention that energy waste and loss is not measured, let alone accounted for or approached seriously by that mythical “we” that is supposed to do all these good things for our species and the planet, enact all those wise and decent policies and all. So I’d reformulate the notion that the thing that is “too cheap to meter’ is “our” collective commitment to use and waste. That Seneca curve looks rather menacing….yikes! I do wonder what the energy mix for our society will look like once the flow of capital to all the frackers gets cut off. And yes, society looks hopelessly unprepared to endure a rapid shift toward energy conservation. 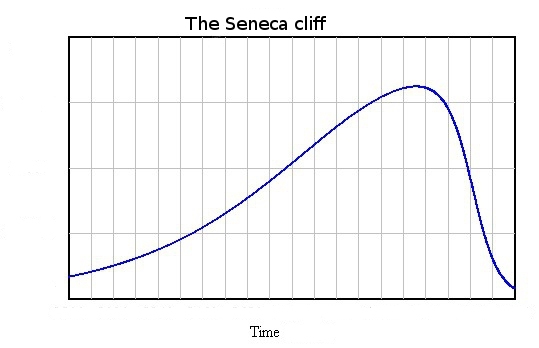 That Seneca curve also illustrates what Hemingway once said about how he went broke – “Gradually, then suddenly” but there is something else that worries me in that steep curve. That is the possibility of cascade failure hidden in it. So instead of peak oil you also have peak finance, peak economy and all the rest of it in a banquet of consequences. Near coincident collapse of multiple systems appears inevitable. Our best choice is to save and preserve what we can for the future. Humankind may adapt and survive, if we are very lucky. If we do nothing until hammer strikes anvil or waste our efforts on fore-doomed nostrums, the Society on the other side will be left with nothing but their hunger, their sicknesses, their ignorance, their endless fatigue and fear with little to strive toward but death. Sounds like life on this side too. 5 and 6 are the real monsters. Jevon’s paradox makes much of the analysis in these paragraphs difficult as, compounded with the difficulty of measuring an energy source’s true EROEI (of course controlling for finance shenanigans) we also have to account for our tendency to consume more resources given improvements in efficiency for particular technological and economic tools. Finance obfuscates and, in a perverse way, lubricates the gears of the unconventional fossil fuel machinery. You could say modern finance is “more efficient” WRT capital movement, investment, etc., but its disastrous effects environmentally (consumption) and socially (inequality) are readily apparent. That increased capital dynamism and utilization, coupled with a lack of democratic accountability and control, has a tremendous cost, as with increased fossil fuel consumption. More on the technological side, air travel has made incredible progress in 100 years. To where, a NY to LA trip on a full, modern commercial jet liner is more efficient than the same trip made by a 1.5 occupant road vehicle. All fine and good until one considers the increased energy consumption that accompanies more people considering such a trip economically viable WRT their time and money. More trips are made that would otherwise be impossible or difficult, hence more energy consumed, ironically, because of the increased efficiency. I don’t see a whole lot of options outside of some Eco-authoritarian system when one considers the above. Which, though it may be a provocative position, I’m not necessarily renouncing. If the universe is zero-sum, there have to be restrictions built into any model of economy where the actors are not living by tooth-and-nail. Technology’s costs are just too high, and it allows us to work outside the boundaries set for all other species on this planet. As in, do what the body and environment allows, or die. A little nitpick on the end of , wind and solar subsidies are a modest 40% of total project cost when accounting for fed tax credits (30%), state tax credits (these can be available to nearly any development that qualifies, including fossil fuel), and things like RECs. I think I am being very generous here. It is probably more like 35% of the project cost. Though solar may be more like 40% because of the higher SREC value. Then there is nuclear with a supposed EROEI of 75 (from Wiki sources). I’ll just say they are full of s***. Where are the below 2% of nominal rate government bonds, and fed loan guarantees? Mining costs? Refinement costs? Decommissioning costs? Waste disposal costs? I could go on and on. I can say similar for coal, nat gas, oil. These industries are subsidized well beyond 30% of project cost when one considers the entire supply line (political policy along with wars, penny on the dollar land rights, etc.). EROEI seems a lot better when half of the cost is lost in the ledger or offset onto states, municipalities, or the whole damn planet (CO2 from oil, gas, coal and radiation from Fukushima, Chernobyl). All the above is tied into Jevon’s paradox as well. Improvements in government efficiency can also mean streamlined (non-existent) regulation and rock bottom bonds with subsidies. So we are consuming resources, fossil or otherwise, that would be impossible to consume without the “efficiencies” provided through politics (again, war, reg/dereg, etc.). It is a mess. From a pure material cost/benefits (i.e. no financial economy or social or political consequences taken into account), I remain a strong supporter of non-work (of not driving to work, not wasting resources by working, not dealing with the aftrmath (delayed costs of working, ilness, etc…)) and beliver in shifting people in bu****it jobs over to early retirment (better name than UBI, don’t you think). The preconditions being that we can come to an agreement as to which jobs are pure bu****it, which are only part BS, and which are actually usefull. My take on this is that it will be impossible without some sort of a planned economy model (one that doesn’t try to pretend that most people have nothing productive to do, and simultaneously doesn’t make a fuss about it). I’m not actually optimistic about this outcome, obviously. 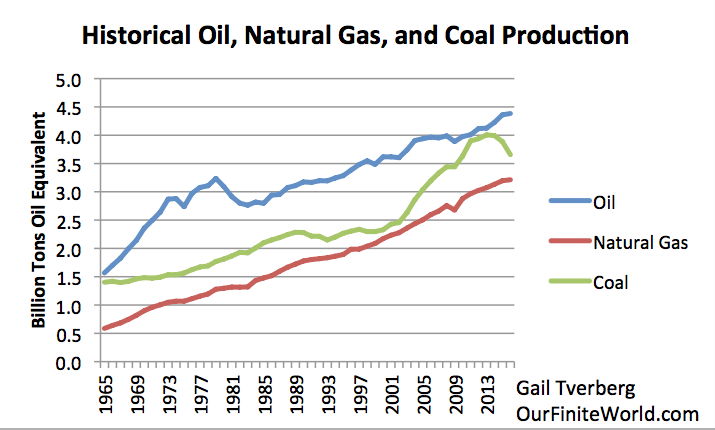 It’s not really fossil fuel – the major problem with peak oil theory( which I bought into years ago ). If this sounds strange and bizarre to you it might be time to do some serious reading. Without disputing Engdahl’s assertion here, I guess the follow-on question would be is said oil being produced as fast as we’re using it (assuming use would continue to increase exponentially as well), and is it as readily available immediately, or is it continually harder to produce, as would be expected? But regardless of that rather speculative assertion, what would continued consumption mean regardless of the source for environmental degradation (including AGW) and the human population pressures it would enable/encourage, as the underlying problem of problems remains: human population overshoot and our never ending technological cornucopian mindset. The earth exists for a whole world of reasons other than infantile notions of human wish fulfillment. Somewhere along the line during the last 250 years or so we’ve forgotten that. I think James is being too kind. Did you do some serious reading of this stuff you referenced? What am I supposed to do with a red-herring mentioning Russian scientific “empirical” demonstrations that oil is created by processes deep in the Earth’s mantle, some odd quibbles about Hubbert’s Peak Oil calculations for ‘conventional’ oil, and some hoopla about major new shale oil discoveries in Texas and Arizona? If you’ll recall, shale oil is a ‘non-conventional’ oil, difficult and expensive to extract and explicitly excluded from Hubbert’s calculations. I see little point in belaboring a red-herring and a non sequitur. Take the major new shale oil discoveries at face-value — how long do you expect the great shale oil boom in Texas and Arizona to last? How does this cornucopia of oil affect the analysis in the post? Would you care to draw any assertions using this great shale oil boom as a warrant? I spoke many years ago with some engineers from the Texas oil patch who had worked in eastern Russia and were well aware of Russian deep wells, putting abiotic theory into practice. As Ben Stein’s much funnier dad (Herb) famously said “If something can not go on forever, it will stop”. The assessment of wind and solar power in today’s post contrasts greatly with the happy speculations in the earlier post and links regarding the Green New Deal. There is no doubt that life depends on energy. It was solar until around 1830s when steam engines and coal exploited underground stored solar energy. WWII was about conquering petroleum sources. In the current nuclear age; extinction and the basic human contradiction between war and cooperation are in play. Energy for Western workers became too expensive after the first Oil Crisis. Burgeoning debt and offshoring are the result. It also means that the only profit in the West in the 21st century comes from extortion and exploitation. Humans can go back to the population and technology of a couple centuries ago and survive for a long time. Unfortunately, as long as our human nature remains unaddressed, greed and incompetence assures that the Anthropocene epoch will end, suddenly. The Franco-Prussian war was a resource grab for coal. WWI was the original grab for Middle East oil: Austria-Hungary by land and Britain/France by sea. It has continued. Maybe I read too fast, but I did not see the high cost of technological development and exploitation taken into consideration. STEM requires a large, society-spanning infrastructure and culture, including political culture, not at all cheap to develop, maintain, and use. The fish that lives off 10% food-gathering expense is the beneficiary of billions of years of Evolutionary R&D.